Transcription is bidirectional from the intergenic region. 7 proteins are produced. On the v-sense: Movement protein (MP), CP and V2 protein. On the C-sense: Rep, C2, Replication enhancer (REn) and C4. GEOGRAPHY BCTV: Occurs in the arid and semi-arid regions of Western North America from Mexico to Canada, and in the Eastern Mediterranean Basin, from where it appears to have originated. 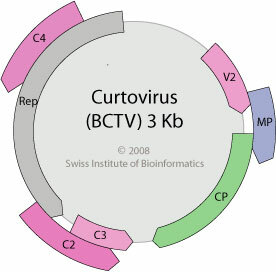 Curtovirus protein Rep is probably responsible for inhibiting host retinoblastoma protein and inducing transition from the G1 to S phase in preparation for virus replication since the virus targets differentiated non-dividing cells. .
Curtovirus viral proteins are able to suppress host cell RNA silencing either by inhibiting host-mediated methylation of viral DNA or by inhibiting post-translational gene silencing (PTGS) .